With exhibition season about to kick off, there will undoubtedly be a number of event organisers in a blind panic because they have forgotten to order their exhibition stand kit, can’t find an important part of the display kit or simply haven’t done any pre-event marketing. Well, don’t worry! Whether it's your first time exhibiting or you're a seasoned exhibitor pro, we have a range of products and tips to ensure you are show ready and get the most out of your opportunity to engage with new customers. This first step is really to get the focus on your business objectives. What is it you wish to gain from the event and why are you attending? You need to set SMART exhibition objectives. Don’t just exhibit because you do it every year. It’s pointless. You need to have an end goal, then put necessary steps in place to ensure you reach that end goal and see a return on the investment. For example, you may be attending this exhibition to launch a new product or service. It might be simply to raise brand awareness, widen your customer database, network with new business contacts or generate sales. Whatever your objectives may be, an exhibition is a perfect platform to enable you to meet them. Your SMART objectives need to be specific, measurable, attainable, relevant and set within a specific time frame. For help setting your objectives read our useful article on how to set SMART exhibition objectives. Pre-event marketing is so important. Even if you’ve left it until the eleventh hour, it’s still effective and still very much needed. It is important to reach out too new and existing customers, suppliers, business partners and any business contact you have that would benefit from attending the show. There are several effective ways of letting people know you’re exhibiting at this show so it beneficial to maximise the use of them all to market your exhibition attendance effectively. Social Media – all social media platforms are free to use which is the best part. They don’t cost you anything to use and yet they are one of the most valued and effective forms of business communications. You must include information such as your stand location, event times and dates. Don’t just post once and think that’s enough, post and post again. Check the event page for discussions and jump in on any chance you get to interact. Use the event hashtag, this will widen the amount of people who see your posts. Marketing emails – this communication channel is not always free but most business already have this set up. Send a marketing email to advise your existing customers you are attending an event. Include all relevant show information, and most importantly include reasons why they should visit you. Any marketing email should always include a clear call to action. Communicate internally – this is often an area most forgotten about, but internal communication is important. Let employees know about then event. It can create a real buzz in amongst staff, and you are far more likely to generate buzz externally if your team is behind you. Ask your sales team to send personal invites to valued clients. This will help strengthen their relationships and make it feel more personal. It also provides the perfect opportunity to personally invite them to your exhibition stand for a meeting. Another great idea which doesn’t involve additional expense is to make use to company email signatures. Update employees email signatures to include event details. This is a great way of further promoting your exhibition attendance. If you already have an exhibition display, be sure to dig it out and thoroughly check it before you commit to taking it. It would be very unfortunate to arrive at your event with an exhibition stand that is looking tired, old, creased, dirty, or worse…broken. With a huge range of exhibition stand systems to choose from, how do you make sure you choose the right one for your business and event? That’s easy, talk to XL Displays. We create, design and build Exhibition Stand Solutions that get you results. Whatever your ambitions or budget let us take the pain out of arranging your Exhibition Stand requirements and deliver a stand that can wow your potential customers and meet your business and marketing objectives. Your exhibition stand system needs to be flexible, versatile, fit for purpose and be effective to your needs. Our portable display solutions are exactly that. Portable being the keyword, they are exceptionally easy when it comes to transporting from event to event. Cost effective, our roller banners start from just £49, and our printed tablecloths start from £52. Our bestselling portable exhibition display is the traditional pop up stand. With the ability to go in the back of any car the Pop Up Display Stand is the ultimate large-format portable display stand. All our Pop Up displays are portable and supplied with a tough wheeled transit case – all the components fit into the case to enable easy transportation and storage. Pop up stands can be set up within 10 minutes by one person, without tools or special training. No additional contractor costs required. Our modular exhibition stands are designed with the ability to grow alongside your business and marketing needs. Centro modular displays and Twist flexible exhibition stands can be added to at a later date. The modular systems allow you to adapt and change your display using individual sections, adding gigger graphics or new components as required, without having to purchase an entirely new stand. Our modular exhibition stand range includes other systems which can too be added too later, Linked Pop Ups, X-GLOO, Linear and Vector. Our bespoke exhibition stand solutions are designed to suit your requirements. Bespoke exhibition stands are completely unique to you - just give us an idea of what you require and we'll come up with a full render so you can see what it might look like. Our range of bespoke exhibition stands includes Shell Scheme, Linear and Vector, Twist and Fabric High Level Branding. You need to think about your exhibition stand as an investment. Look further ahead than the event you’ve got in a week or two, and plan your exhibition stand around this so you can maximise it. Graphic design is everything, people will look at your stand and make their decision about visiting you there and then. You need a clear marketing message, bold branding and clever design to make your exhibition stand work for you. This is not an area for you to take lightly. We have a team of expert graphic designers with many years of experience in creating effective artwork for events and exhibitions. 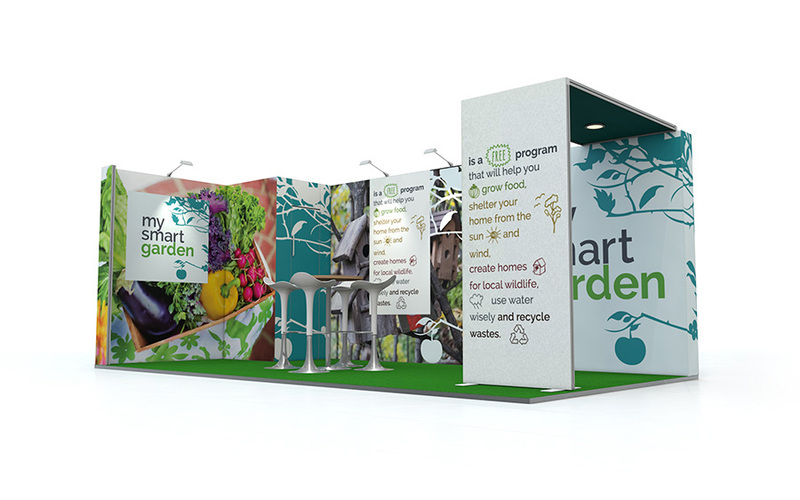 We can design your exhibition stand for you based on your stand brief, event requirements and brand guidelines. Alternatively, you can provide your own artwork which we will check before sending to print. Read our 10 Top Tips for Exhibition Stand Design for help ensuring your exhibition design is up to scratch. At XL Displays we provide portable display solutions and custom built exhibition stands. Please contact us or call our sales team on 01733 511030 for more information.